Do you want to be on a hit Elements Media Networks TV show? 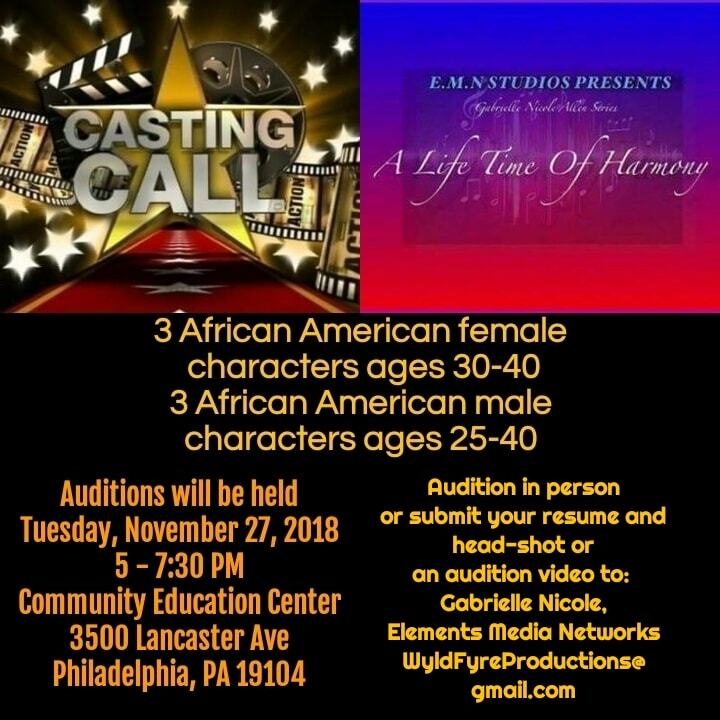 A 2018 casting call for “A LIFETIME OF HARMONY” is looking for you! A multifaceted, no-nonsense woman with a tender heart and a flip mouth. Harmony manages a team of officers and assistants who are employed to work on individual artist’s tours. She expertly provides the essential link between developing and delivering the artist relationship strategy for her organization, but is very inexperienced in maintaining healthy love relationships. Syndicated Columnist Geronimo’s best friend raising his youngest sister’s pre-teen son, who who wants to walk in Geronimo’s foot steps. Roscoe is everybody’s father giving advice, fixing problems and is the keeper of secrets. Currently in between relationships Roscoe takes a stab at being a long term celibate. Harmony’s long time friend is a looking for love in all the wrong places. She comes from a physically abusive background and attracts narcissistic men like bees to pollen. Cymone is kindhearted to a fault and very gullible. She loves the arts and owns a venue that allows all types of art forms to be explored. She firmly believes that there should be no separation of genres and that true art embodies real life and is the best possible method for getting people of all races and backgrounds to come together to find common ground. The Music Director for the house band at Everything In Between, is in love with Panama but is relegated to the spiritual brother zone and, often necessary, body guard. Jason teaches children’s free music classes at the local recreational center in an attempt to introduce real music into the lives of his young charges. Tanya is Geronimo’s cousin who is a Spoken-Word Artist and Human Rights Advocate. Creepy Guy is a slick talking male who preys upon young women.